“Up to anything on Monday?” went the text. The bad spelling was clearly catching. Several texts later, we achieved what could so easily have been done in a ten second phone call. But that would be too simple for this modern, enlightened age. 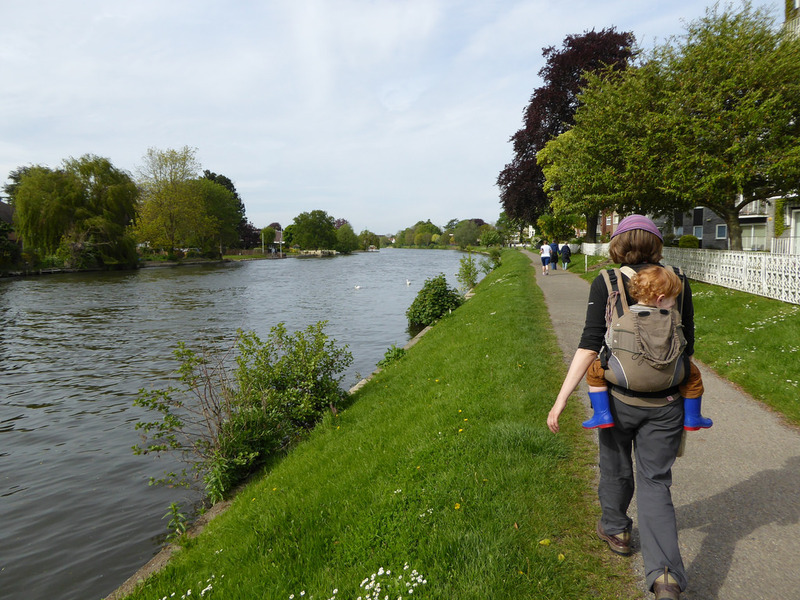 But eventually we agreed – without too much horrendous use of the English language – that a six mile walk down the Thames might be a most rewarding way of spending a day off work. Especially if it involved a beer at some point. And then there was the cryptic ending. T had such an enigmatic way about him. Several times he’d done the “may invite a friend along” routine, stubbornly refusing to name who it would be, even under a barrage of questions. Usually it would turn out to be a mutual friend who we’d known for years. Naturally T didn’t reveal who he was bringing. “What if the friend turns out to be one of us?” pondered Catherine, as we mused the more existentialist options where T would turn up by himself and point to us when probed on where his “friend” was. “It’s all right. He’s confirmed I need to buy four train tickets,” I replied, knowing that when push comes to shove, no joke is worth spending an extra £4.45 on an unnecessary train fare. Not even T would go that far. The mysterious friend (who, in a turn up for the books, wasn’t someone we knew) may have wondered what she’d let herself in for as she stood on Shepperton railway station, watching as Sam slowly toddled down the platform waving constantly at the train we’d just alighted from. He’d taken quite a shining to trains. And trams for that matter. And buses. Basically anything with wheels was a source of delight for this seventeen month old. But waving at a stationary train was a new one. Perhaps he thought he was waving it off; sending it on its way. Who knows? However as Shepperton’s at the end of a branch line, the train wasn’t in a rush to head off and we almost had to drag Sam off the platform and quietly persuade him that contrary to all evidence, he really did want to go in the back carrier for a short while. At least, until we got through the town’s busy streets. The station was a mile or so from the river, and we wandered through what looked like a rather pleasant town with a bit of money about it. Albeit one with a disproportionately large number of charity shops in it. 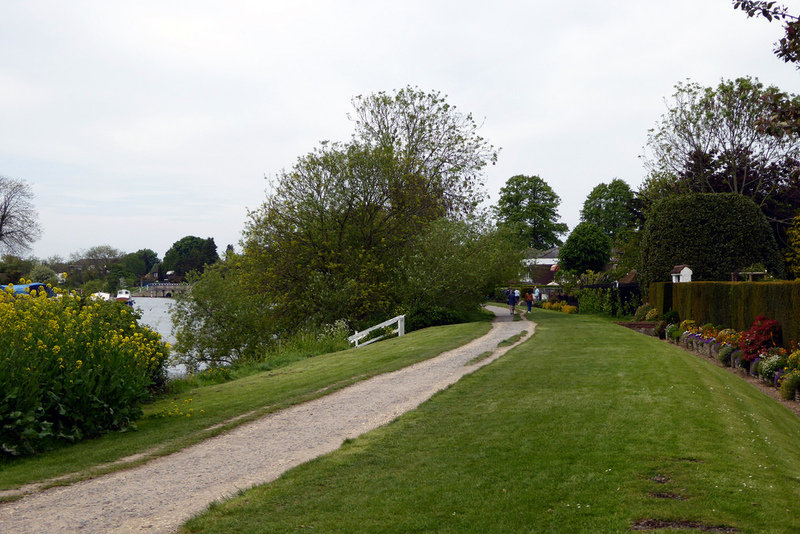 On the edge of the town centre, we picked up the “Thames Path alternative route” – the route the Thames Path follows from Walton Bridge when the ferry isn’t running – and soon found ourselves at Shepperton Lock. A sunny day seemed to have drawn those of a nautical persuasion, and the lock was full of boats waiting to get upstream. The path at the side of the lock wasn’t much quieter as groups of all ages sat basking in the sun, watching the boats slowly rise. 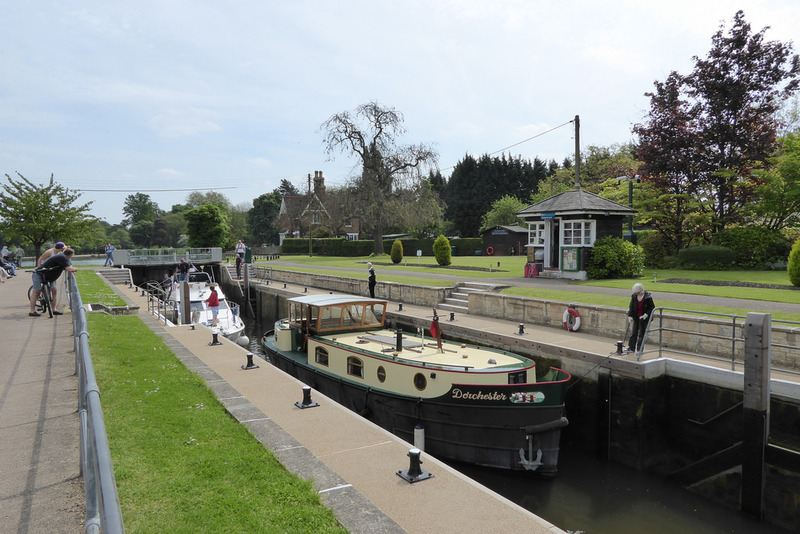 As the lock gates opened, we meandered on, letting Sam stretch his legs. Several boats passing by him seemed to pose no interest at all, his attention instead taken by daisies, grass and the odd pebble. For a while, the Thames Path followed a road imaginatively called “Towpath”, perhaps giving a hint of a past life before it was covered in tarmacadam, and lined with houses. Moorings lined the riverside, many with post boxes alongside them, for on the other side of the river sits a place more difficult for the postman to get to. Pharaoh’s Island sits in the middle of the Thames, once owned by one Admiral Nelson. The scourge of Napoleon Bonaparte used it as a fishing retreat, but in more recent years a series of residential abodes were built on the island. I idly wondered about the practicalities of living on an island with no road access. Clearly they’d got the mail situation sorted out, but what happened if you wanted to get a new cooker delivered? Or just fancied popping out for a pint? Could the river police arrest you for being drunk in charge of a motor boat if you’d had too many pints in the nearby Thames Court Inn? And what happened if someone came to visit? How would you know they’d arrived? The answer to that came in the form of a large brass bell, with a discrete plaque proclaiming it to be the “Pharaoh’s Island Visitor Bell”. But with fourteen houses on the island, you may end doing a lot of ringing. “Towpath” soon became the equally enigmatically named “Docket Eddy Lane”, and headed inland, leaving us to follow a more traditionally styled tow path of stones and gravel past the Ryepeck Meadow Moorings; a stretch taken up by a series of elaborate house boats. Although flood damage meant that the path had been diverted away and slightly inland. The diversion did look semi-permanent, leading the walker to wonder which flood had actually caused the problem. 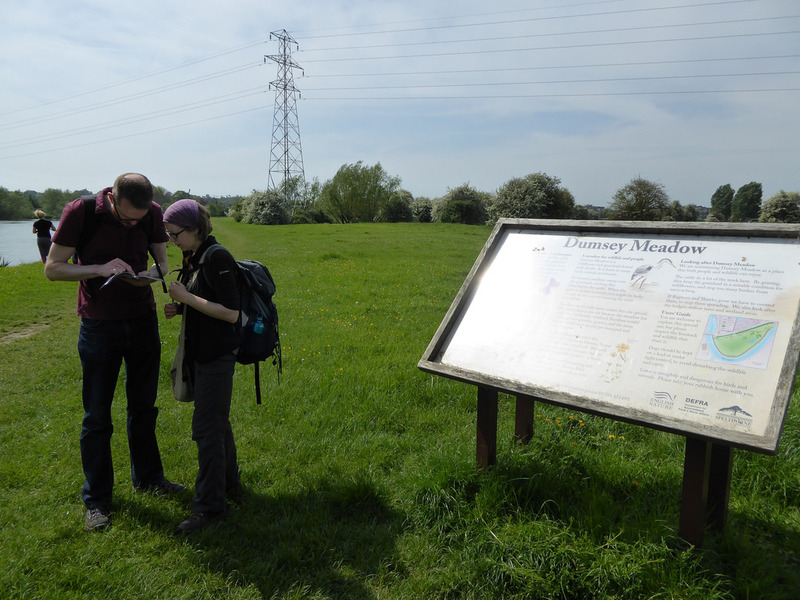 A giant interpretation board, sized so that easily five or six people could all stare at it at once, welcomed us to Dumsey Meadow. A Site of Special Scientific Interest, the sign told the army of people crowding round it that they were now standing in the only area undeveloped water meadow east of Reading. It didn’t look particularly much. Just a meadow of grass and the odd shrub, with electricity pylons heading overhead. 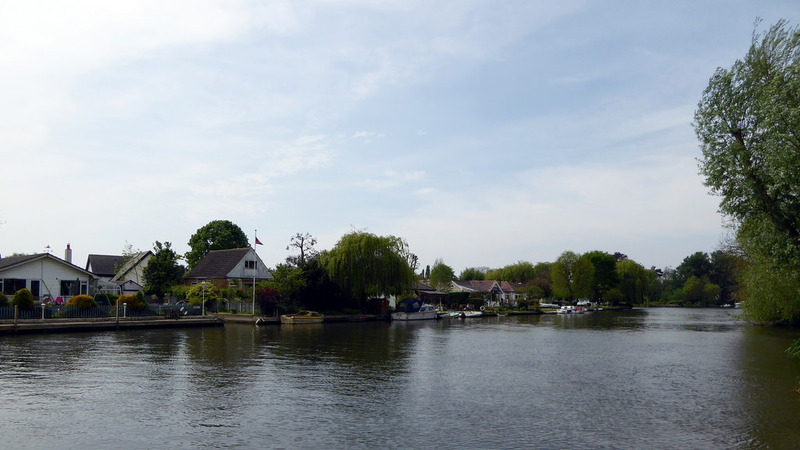 But once a year the place takes on a whole different feel as it plays host to the Chertsey Regatta – properly known as the Chertsey in Shepperton Regatta. Every July, the crowds come to watch the skiffing and punting competitions, in an event that was first hosted in 1851. Popping under Chertsey Bridge, alongside Chertsey Lock and under the bridge carrying the M3 motorway away from, well, Chertsey. 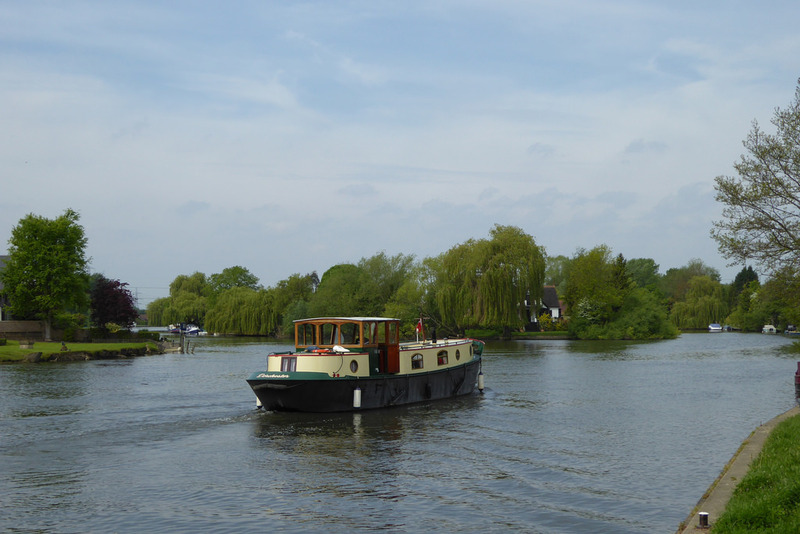 Somehow it managed to protect Chertsey from the trauma of road noise, although Laleham on the other side fared less well; the sound of traffic accompanied our walking for the next mile or so. 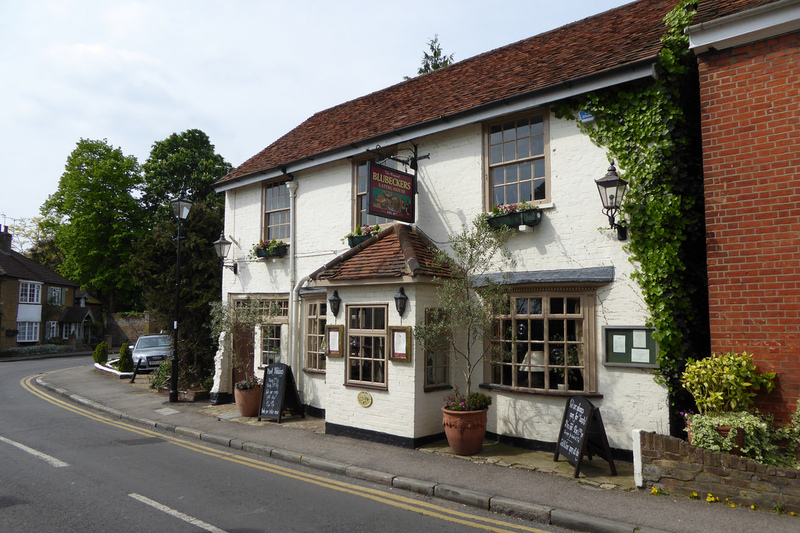 With lunchtime came a detour to Laleham village, and a large pub broken into many rooms, and with a substantial whose charms were difficult to resist in the fine weather. But an afternoon supping London Pride and relaxing in the sun wouldn’t get us to Staines, and reluctantly we departed having had our fill of fine food and glorious ale. Back on the Thames Path, the local residents seemed to be partaking in a competition as to who could have the most attractive floral display to line the path. That their gardening efforts were regularly unviewable from their houses, being on the “wrong” side of hedges and fences, didn’t seem to bother the local gardeners, and several were obviously fighting for some sort of unofficial “Thames Path in Bloom” award. As well as gardeners, the local residents also seemed to have a particular interest in flagpoles. 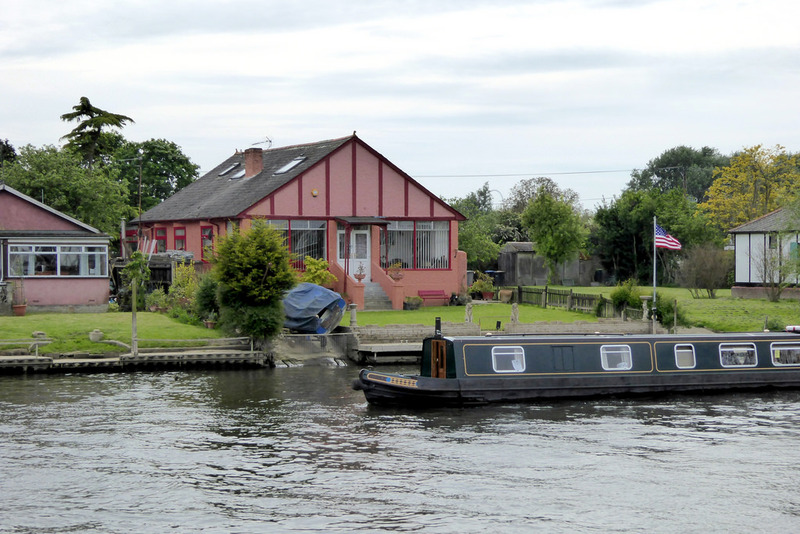 Throughout the day we’d seen several, proudly flying in the light wind, and near Penton Hook lock we spotted our third house flying the Stars and Stripes. I couldn’t help but wonder how it had all started. Was the plethora of Union Flags flying the result of some brash American deciding to fly the flag of their native land? I could almost imagine some Brits tutting loudly at the very thought, before rushing out to erect their own flagpole. Sam never worried too much about flags. He was much more interested in more mundane sights. Freed from the back carrier, he proceeded to stretch his legs, running down the path for a few metres before stopping to look at whatever there was to be seen. For someone used to counting off the miles, walking with a toddler can be infuriatingly slow. On the other hand, it’s a way of looking at a path in a whole new light. When do we ever squat down on the ground and just stare at insects as they go about their daily business? Never. There’s always too much to do. And as for having time to smell the roses… Yet to a toddler there’s so much to explore; so many new things to see. And Sam was intent on seeing it all. So much so that it took us over an hour to cover a mere mile of walking. And in the end, just outside Staines, he was coaxed back into his carrier. Normal walking speed swiftly resumed. “I didn’t expect Staines to be this nice,” remarked Catherine as we meandered along the tow path, towards the centre of town. Not for nothing did Staines officially change its name to Staines-upon-Thames in 2012, in an attempt to play up its riverside location and play down more negative connotations, including its link with comedy character Ali G.
Our need to catch a train home though did deprive us of a thorough inspection of the place. Was the river the nicest part? Was the town centre just some grim wasteland, frequented only by balls of rolling tumbleweed? But as the road to the station didn’t go through any of it, taking us down residential streets instead, we’d just have to wait to find out more. Besides, it was unlikely it would be quite that bad. There’d be at least a branch of Boots and probably a Greggs or something. Perhaps, even a dry cleaners with a dodgy name. And if there wasn’t, well there must be potential for one. First Published: 9 July 2014. Last Updated: 11 July 2016.